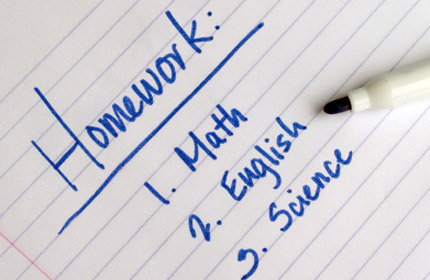 To address homework issues, you should first become familiar with the various problems associated with homework. Many other problems could be added to this list, but these are the major ones that often make parents feel like they are back in school. Parents of children who struggle with homework completion often work with their children each day on homework – struggling and experiencing frustration, anger, and perhaps guilt that drive them to assume responsibility for their children’s work. The following plan focuses on each of the problem areas. It is a behavioral approach that involves the development of habits or skills. Behavior becomes a habit only with repetition and practice over many learning trials, and you must be prepared to assume a supervisory role, working daily to bring about needed changes. #1 Utilize the Student Agenda / Calendar! Each child should keep a Student Agenda or calendar. The Student Agenda should be brought to and from school each and every day. #2 Verify the correct assignment has been written in the Student Agenda / Calendar. Your child must learn to regularly and correctly record assignments. This habit will help him (1) begin to take more responsibility for his work, and (2) develop greater independence in home and at school. A parent can assist a child in developing this habit of writing assignments daily by reviewing and practicing this process at home. #3 Avoid recording assignments incorrectly in Student Agenda / Calendar by slowing down. An additional underlying problem that may make it difficult for the child to complete this task is rushing through the task – they may see it as unpleasant, simply wishing to “get it over with as quickly as possible.” Sometimes students lack detail in their writing, and even when asked to redo their work, they often do not improve. To deal with this problem, the child may be taught a self-instruction “slow down” procedure. For example, teach your child to “verbalize” her performance as she writes (e.g., in making a large capital letter G, the child would describe her performance: “First, I make a slanted line going up to the right and then loop left at the top…”) When the child does this, her writing must slow down. In addition, the child is now using the left brain (verbal) to assist in this basically nonverbal, visual-spatial, visual-motor task (of the right brain). Thus, a whole brain approach is used. Such self-talk during work will serve to slow down the child’s normally fast and impulsive style. #4 Check that Chromebook is brought home each day. Reinforce this behavior. The Chromebook is expected to be brought back and forth between home and school daily. Failure to at least bring the assignment book home and to school each day results in a loss of privileges for that day. Improvements and positive changes in this habit must be monitored and reinforced both at home and at school. #5 Check that necessary materials are brought home each day. Reinforce this behavior. In this behavioral program, whether formal or informal, all privileges are suspended until the child is caught up on his or her work. Monitor this behavior daily. Should the child fail to bring home materials needed for homework over the weekend, be aware of this one Friday so that privileges may be suspended over the weekend. To avoid this situation, the child must practice at home, asking himself what materials are needed for each homework assignment, and then checking to be sure that he has loaded these items into his book bag. Doing mock exercises on this routine will help make this procedure a habit. #6 Is my student capable of completing this amount of homework? From time to time, most parents will become frustrated with homework taking too long. To help your child with this problem, first check the amount of homework given. Many of these children are simply unable to complete large assignments. Consultation with the teacher may result in a shorter homework assignment. #7 “Chunk” large assignments into smaller, more manageable portions. To foster the development of the homework habit, develop a routine that can be practiced each day. Several factors are involved; the two most important are the “where” and “when” homework is to be done. #8 Do Homework in a tidy, quiet area each day. Homework should be done in an environment similar to what a student encounters in school. The student should be sat at a desk or table with good lighting, necessary materials (pens, pencils and paper) and away from distractions. The study place should be consistent, with the child doing homework in the same place each day. #9 Study time is sacred. The child must have a homework schedule. This does not mean fitting homework into a busy schedule of piano, dance, volleyball practice, and so forth. While social activities are important, you and your child must prioritize, organize and develop a schedule centering around homework. This regularly scheduled time should allow the child some flexibility to engage in important outside social activities, but one should never sacrifice the time set aside for homework. A general recommendation is that the child should devote at least two hours per night for upper level grades and through high school. In the absence of teacher-assigned homework, the scheduled time is spent doing some type of educational game, reading, or preparing for an upcoming test or project. Homework time should be viewed as sacred. Even with a designated place and a schedule for homework, there are often hassles over homework time. The child whines, cries or has a tempter tantrum when it’s time for homework; this is sometimes related to the difficulty of the work to be done. The Premack Principle may be used to make difficult tasks more palatable. Suggest (1) doing the more difficult tasks first, and (2) doing homework before an enjoyable activity. Essentially, when difficult work is followed by something that is less difficult and more fun, the first activity becomes more pleasurable. Lying about homework is not unusual with children who struggle academically. First, lying may allow the child to escape an activity that is perceived as unpleasant. Second, the act of lying is a kind of “risk-taking” that creates some stimulation and excitement for this child of low-arousal state in the nervous system. Dealing with lying can be difficult for the parent. Some children have practiced so much that they become quite adept at lying; it may even have become a habit. When your child first lies about having homework, then later (after being accused of lying by the parent) tells the truth, ones first response is to punish the child. A parent may believe he is punishing the child for lying about the homework, but in reality, the consequence for the behavior is punishment right after telling the truth. An alternative response from you might be, “I really appreciate your telling me the truth about your homework.” In this case, the child is being rewarded for telling the truth. Proper use for the PRIDE book is beneficial in keeping communications clear about homework. If the student has correctly written in his/her assignment during class, it should be relatively clear as to whether or not your child has homework. The PRIDE book includes a space for the teacher to communicate with the parent. This is a good place for teachers to provide feedback to the parent regarding academic progress, behavior, missing/incomplete assignments and upcoming projects/tests. Be sure you are checking this space for important information from your child’s teacher. Parents should act as homework “consultants.” This means that you should not do a child’s homework, nor should you be in the child’s presence every moment of the time spent doing homework. Once a child is familiar with the task, you need not stay directly by the child. Answer questions if and when needed. Assigned homework is clearly the child’s responsibility. If you provide excess help or actually do the work, the child is being set up to become overly dependent upon others. When similar help is not forthcoming in the classroom, the child may feel lost and confused. The goal of establishing good work habits in the homework environment should be the carryover ability to use these habits and skills in the classroom setting. You therefore must prepare the child to work under typical classroom conditions and to meet expectations similar to those of the teacher. Your child’s failure to bring home papers to be signed should result in a suspension of all privileges. Alternatively, your child may be praised for bringing home test papers, even when they reflect poor grades. Remember, the focus here is on habits about homework and schoolwork. “Forgetting” homework at home is really not a memory problem, but is rather a lack of organization. The PRIDE book has a place to check when homework is completed and then filed in the subject binder. The PRIDE book is placed in the school bag when all assignments for the day are completed. Where should the child place the school bag? The answer is simple – in the same place each night. It is only through repetitive practice of a routine that the routine becomes established. Whether these newly developed habits are maintained will in turn depend on whether they are reinforced. How generalized these habits become will likewise be a function of how often they are reinforced and in how many different situations.